This pralines recipe has been a family recipe that my mom has been making for over 25 years. Whole snappy pecans in a browned sugar coating, these treats are a kind of cookie that is a classic in the south and, especially, New Orleans. Classic New Orleans style Pralines are kind of a big deal in my childhood. Even though they are made throughout the south, New Orleans is famous for their pralines (prounounced praw-leens). I highly recommend that if you ever make a trip, make sure to make a stop at Southern Candymakers in the french quarter. It’s near the French Market and the famous Cafe Du Monde. So how did a girl from Nashville have this recipe? Well, if there were one treat I would most associate with my Dad, it would be pralines. My mother made them every christmas, every birthday, and probably a few more times a year. She spent years experimenting and perfecting her pralines to taste exactly like the memories of the New Orleans my Dad grew up in. Of course, I have been to New Orleans to compare them, and I have to say these are pretty authentic. Recently, Mom came up for a visit and I begged requested she make her pralines recipe so that I could share with all of you. Luckily, she obliged and shared all of her tips from making them over the last 25+ years. 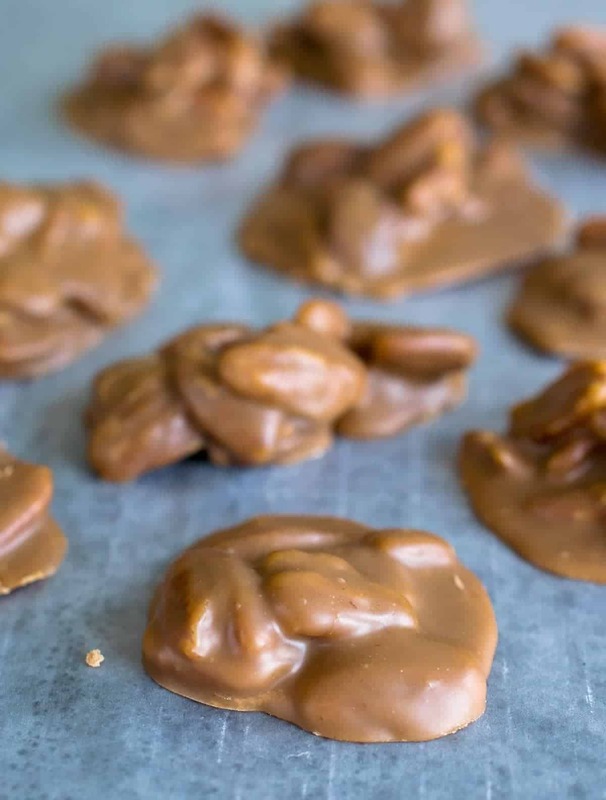 A praline recipe is fairly simple and straightforward, but like with any candy, there are some tips to making them just right or it can seem tricky. Read the recipe through before starting and have everything ready. This may seem like common sense, but even I have found myself not reading the recipe entirely through before I start. This recipe moves very quickly and you need to be ready for the next step when it comes up. 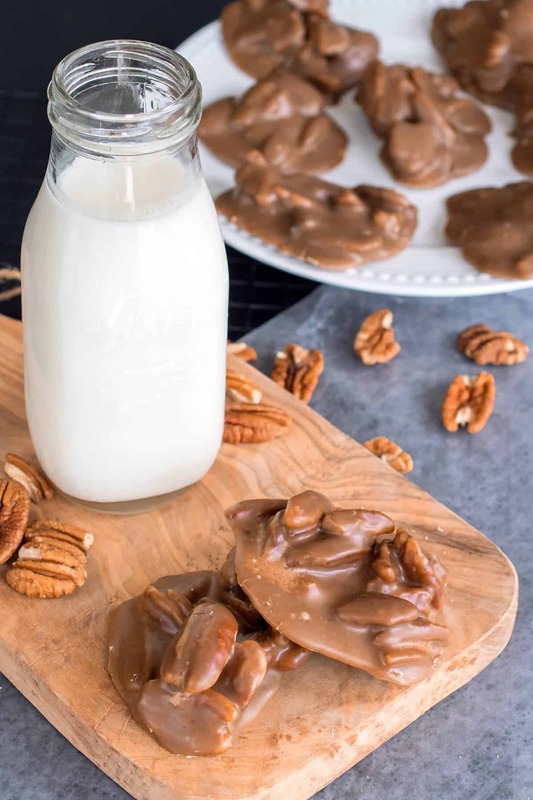 Don’t Double the Recipe – The problem with doubling this praline recipe is that the pralines may start too cool too quickly as you are putting them out on the wax paper. Dropping them Down – You don’t want to start laying them out too early or the candy coating will run out further and away from the pecans. After the baking soda and vanilla are added, don’t stop whisking/beating until you are ready to drop them. Otherwise, the syrup may cool unevenly as you spoon. Nothing is better than fresh pralines. Unless you have tasted them just after they have cooled, you haven’t lived. Pralines can be stored in an airtight container in a room temp, dry place without any problems. After a day or two the sugars may begin to crystallize in the pralines. They are still plenty delicious, so don’t be worried if you notice them turning lighter or beginning to show white specks or crystals. Wooden Spoon– A wooden spoon is preferable in this recipe because it doesn’t transfer heat. Candy Thermometer – Really recommend this one for getting the pralines exactly right. It doesn’t need to be an expensive one, it just needs to be accurate. Combine the sugars, pecans, buttermilk, and salt into a large, heavy saucepan over low heat. Stir gently but consistently until the sugar dissolves. Cover and cook over medium heat for 2-3 minutes to wash down the sugar crystals from the sides. Uncover and, stirring constantly, to 234 degrees on a candy thermometer. This is called the soft ball stage. Immediately remove from heat and stir in baking soda and vanilla. Stir vigorously with a wooden spoon until the mixture begins to thicken. Working quickly, drop by spoonfuls onto wax paper. Let stand until firm. Watching your Mom perfect this recipe over the years I can tell you that the most important part is getting that temperature right. Too hot is no good and too cool is no good. Ultimately, what makes Mom’s pralines so special is that she uses a lot more pecans than any commercial praline company could afford to do. I don’t know if you remember but Mom tried to get this recipe right for years before she came up with this one. Most people, when they first taste pralines, assume there is a lot more going on with the recipe than there really is. It’s the heat that makes the simple ingredients come together to make pralines the candied perfection that it is. I remember the many, many trials of experimentation trying to get this one just right. You are lucky to have such a wonderful wife who would keep trying, haha. (and a great Mom, of course) This is the recipe that she made the observation about keeping recipes simple. With respect to recipes, I find it true that the simplest version is usually the best one too.